The new Force.com Toolkit for Google Data APIs provides a free and open-source set of tools and services that developers can use to take advantage of Google Data APIs from within Force.com. The end result for developers is a set of classes, written by Salesforce, that allow you to easily communicate with Google services. For example, suppose you want to create an entry in Google Calendar, the following code does it. That is actually just 2 lines of code (line #2 was broken into 5 lines for easier reading). The reason you can do this in 2 lines is because of the toolkit. The toolkit does the “heavy lifting” for you to communicate with Google. From a developer standpoint, the best thing about this is that, to do this, there is no dependency on changes to the Salesforce platform. The Google Toolkit was created by the Developer Marketing Team at Salesforce, not the folks building the platform. Apex Code is already part of the platform. The toolkit uses what Apex Code already offers. What you get with the toolkit is a set of pre-written Apex classes that do the heavy lifting for you on talking to Google. Much like the Salesforce Java/PHP/.NET/Ajax/Perl toolkits do the heavy lifting of talking to the SOAP API for you on those programming platforms. There is no reason that the developer community cannot create similar toolkits. I am sure Salesforce has some more up their sleeve and did the community a service by building some foundational ones for us to use as working/useful examples. This is open source at work. To make an analogy… one thing I love about PHP is that these types of toolkits are prevalent and have made my life much easier. For example, when I wanted to build Auto vCard, I Googled for PHP classes that created files in the vCard spec. I found many and chose 1. Similarly with the Web to Lead Spam Check I built. I chose Akismet as the spam checking service because I was familiar with it and trusted it and I found a PHP5 toolkit that took care of the hard part of communicating with Akismet from PHP. Same thing with my old Google Maps mashup. There are PHP classes that do the hard part of talking to Google Maps. Having these classes at my disposal gave me the ability to focus on adding the business value of tying functionality into a Salesforce-related use case. If these PHP classes didn’t already exist, I never would have created any those apps. Offer up some example code for how the class can be used to help people implement a use case of it. There are countless others. Get cracking! Has the Salesforce / Google Apps integration affected you? Now that Salesforce has rolled out their Google Apps integration, I am curious how people are using it.Â The curiosity period is past and you should have some anecdotes as to how/whether it has actually improved your productivity.Â It’s still early to tell, but any war stories are welcome. Please comment and let everyone know what you think so far. How has the integration affected your day to day use of Salesforce? What components are really making a difference for you now? What components do you feel will make a big difference once you are able to get its use ingrained in your culture? What (if any) applications have you stopped using as a result of the integration? Have you changed any business processes as a result?Â What has improved? What components are “complete” functionality and what is “not quite there yet”? The Salesforce Google Apps integration hasn’t changed anything in my day to day use of Salesforce yet.Â I’ve been a Google Apps user for about a year, so I was the perfect candidate for it.Â What doesn’t make me the perfect candidate is that my collaboration needs are low.Â Outlook still dominates my email/calendar life and this new integration hasn’t equaled or beat the existing Salesforce-Outlook integration can do.Â My current setup is Outlook as my hub.Â Contacts are synced with Salesforce.Â Calendar is synced with Google via Google’s Outlook Sync product (it’s crashes/errors too much, but my Google Calendar is not a priority to me).Â Email is synced with Google since I connect via IMAP.Â The occasional calendar item is synced from Outlook to Salesforce so I can have a record of it there, but I avoid the Salesforce Calendar if I can.Â Using Outlook also lets me sync easily with my Blackberry. Once the gMail integration can do things like link the logged activities to the “What” relationship (Accounts, Opportunities, Cases) as well as the “Who” (Leads & Contacts), I will be much more likely to use it.Â Also, something needs adding in the gMail client to save an existing email from Google to Salesforce, including its attachments.Â The convenience just isn’t there for me quite yet. The Google Docs integration is most immediately useful to me.Â However, it hasn’t fit into a specific use case for me yet, but I can envision it doing so.Â It could be a bit better in keeping things in sync like if I delete the doc from Google, it should delete from Salesforce, but I think that’s asking a bit much right now and I understand why it doesn’t do that. The report export to Google Docs is interesting to me too and I am sure I will use that at some point.Â I know its there and I’ll install it when I need it.Â Reality, though, is that Excel is so entrenched in the corporate world and most recipients I work with would rather get an Excel file than a link to a Google Spreadsheet.Â I rarely, if ever, am collaborating on a document where it requires mutual updates.Â Generally, everyone else is just a viewer.Â Thus, emailing an Excel file works for me. Regarding Google Talk.Â It’s nice that it’s there.Â I use Trillian on my PC, so I am connected to like 7 different IM accounts at once (3 Google ones).Â Having access to one of my Google ones isn’t that big of a help, but it’s nice to know it’s there if I need it.Â I keep it on my sidebar, but collapsed. The Salesforce for Google Apps functionality is live now! 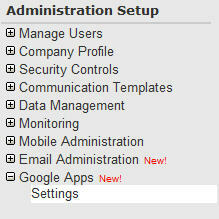 To get started, go to Setup and find the Google Apps Settings menu. Step 1 is to identify your domain. Your company must have an existing Google Apps business account to do this. Step 2 is to enable the features you want. This will be your main control panel for managing these settings. The Add Google Docs to Salesforce feature is very cool and will be very useful! It adds onto the existing Notes & Attachments related list and lets you create/associate a new Doc, Spreadsheet or Presentation to a record. You can also look for an existing document you have and associate that. I am not sure how it handles access to the document by others. You might have to specifically collaborate with people. I did not see any Mail Merge capabilities with this feature. When you enable the Google Docs tab, it adds the tab onto every application you have rather than asking you. You have to edit each application to remove it. This feature is nothing too special. Just a tab to Google Docs. I don’t see any special development Google did on their end to refer to Salesforce in their UI. Enabling Email to Salesforce gives each user a new Email Settings screen where they can edit their personal settings. The idea here is that you BCC a special email address and Apex code will process it and associate the email to your Lead/Contact. I tested it and attachments do not get saved. 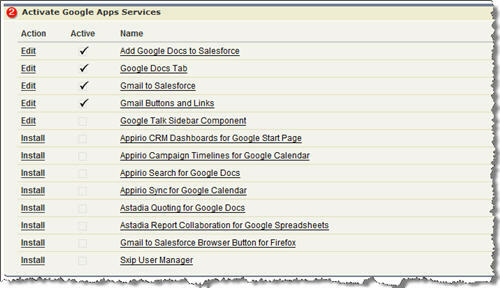 Email to Salesforce is not limited to Google Apps. The image Salesforce has includes gMail, Outlook and Yahoo! Mail. Enabling gMail Buttons & Links adds a gMail link to every email address field. When you click it, a gMail window opens to compose a new email. A special Salesforce email address is BCCed on the message so that it will be processed right into Salesforce for you and associated with the record. Enabling the Google Talk Sidebar Component puts the same Google Talk widget you see in gMail on the Salesforce sidebar. I opted to keep this turned off as I’ll keep using my Trillian client. This feature is not pulling Contact names into gTalk. It’s simply putting your current gTalk contact list on the sidebar. You’d add people the same way as if this integration never existed. I didn’t try any of the 3rd party apps. At first glance the Calendar Sync and Report Collaboration sound the most interesting. What do you think about the new functionality? The Salesforce / Google Apps integration news is coming out now. You can cut to the chase by watching the Salesforce Video on YouTube (embedded below), which explains how it works. Salesforce’s main announcement page is http://www.salesforce.com/googleapps. The permanent Salesforce product page is http://www.salesforce.com/products/google/apps. Save email right to Salesforce like you can do with the Outlook Connector already. Not sure if it has 100% of this functionality such as Attachment saves. Generate Google Docs, Spreadsheets and Presentations right from Salesforce and have them linked to your records. The Google Docs side will allow for strong collaboration and the linkage to Salesforce will ensure that everyone is working off the right document. I was unable to tell via the video if you can do Mail Merge to Google Docs like you can with MS Word. Check out the new Google Apps category on AppExchange to see all the 3rd party apps.